In touch screens using resistive technology, what you actually touch is a flexible plastic layer which protects a thin film of conductive material printed on the inner surface. This conductive material is usually made of Indium Tin Oxide (ITO). Underneath this is another layer made of rigid material such as glass or hard plastic which contains animprint of the same type of conductive material. The conductive material on the inner layer is imprinted so it faces the one on the flexible outer layer. The two sets of conductive grids are separated by spacers placed at regular intervals. The current which runs across the layers of ITO create measurable levels of electrical resistance. The electrical current running across the screen runs horizontally on one layer and vertically on the other, creating a sort of grid. 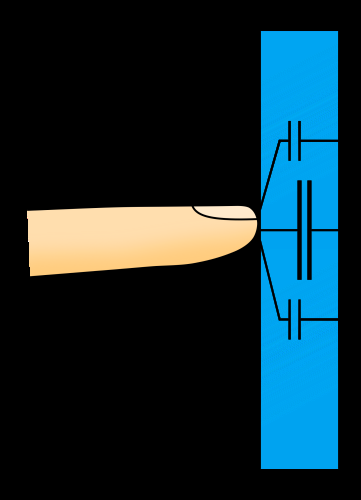 When the screen is touched, the outer layer of flexible plastic deforms just enough to allow contact between two layers of conductors at point of contact. This causes minute changes in the resistance at the vertical and horizontal which allows an accurate determination of touch position. There are really two types of capacitive screens available; the surface capacitive and the projected capacitive. Most smart phones now use the projected capacitive technology, so that is what we will consider for this comparison. Capacitive screens usually consist of two rigid layers often made of glass. The layers are imprinted with ITO layers also running at right angles with each other and separated by an insulating material. Two conductors separated by insulation is what makes a capacitor, thus in each place where the positions of vertical and horizontal conductors cross, there is a small tiny of measurable capacitance. As the user’s finger touches the outer screen, the capacitance at the point of touch varies just enough to allow determination of its location. Resistive screens are more affordable than capacitive screens, and have higher touch accuracy. Thus handwriting recognition software works well when resistive screens are used. Capacitive screens require touch from a conductor or finger to work. Both technologies produce about the same level of image clarity, but capacitive screens are significantly better in bright outdoor conditions. The outer layers of resistive screens are prone to scratches because they are flexible. However, capacitive screens break easily. If you need something which does not easily break for use under normal lighting conditions, you may like resistive screens. For clearer images in bright light and better scratch resistance, choose a capacitive screen.